Boneshaker Books, a small bookstore that hosted the CWW’s annual AWP reading. The audience at the reading, awaiting to hear a selection of poetry and prose from our readers. Anca Szilagyi, our first reader, shared a piece called “Cauliflower Tells You,” featured in Monkey Bicycle. Micah Dean Hicks shared a flash fiction piece and a nonfiction piece during the reading. Michele Nereim read an excerpt of a larger piece. Dena Rash Guzman reading from a manuscript titled “Joseph,” about a feminist’s complicated relationship with the status quo. Big thanks to all our readers at the event. Back row, left to right: Jonah Kruvant, Jessica Piazza, Micah Dean Hicks, Alex Carrigan, Leah Umansky, Michele Nereim. Front row, left to right: Dena Rash Guzman, Jess Burnquist, Sheila McMullin, and Brenda Peynado. Not pictured: Anca Szilagyi and Bianca Stone. 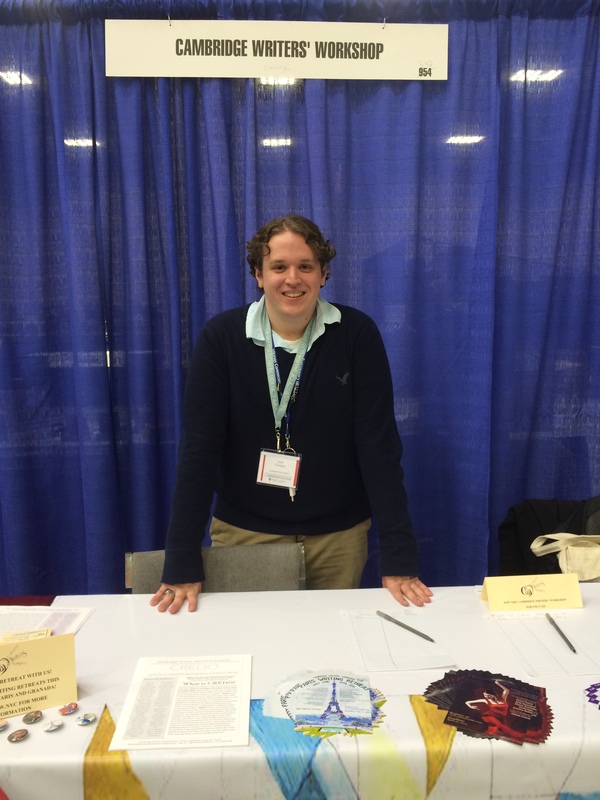 CWW Intern Alex Carrigan manning the booth at AWP 2015. From April 9-11, the Cambridge Writers’ Workshop was present at the Association of Writers and Writing Programs 2015 conference in Minneapolis, MN. Our organization was there with multiple goals in mind, from promoting our CREDO anthology to presses at the event to advertising our summer retreats in Paris and Granada. Our group was fortunate enough to be upgraded from a table to a full booth, giving us more room to work with and allowing visitors to see more of our materials and programs. Visitors were able to take flyers, CWW buttons, and even contribute to our daily exquisite corpse poems. 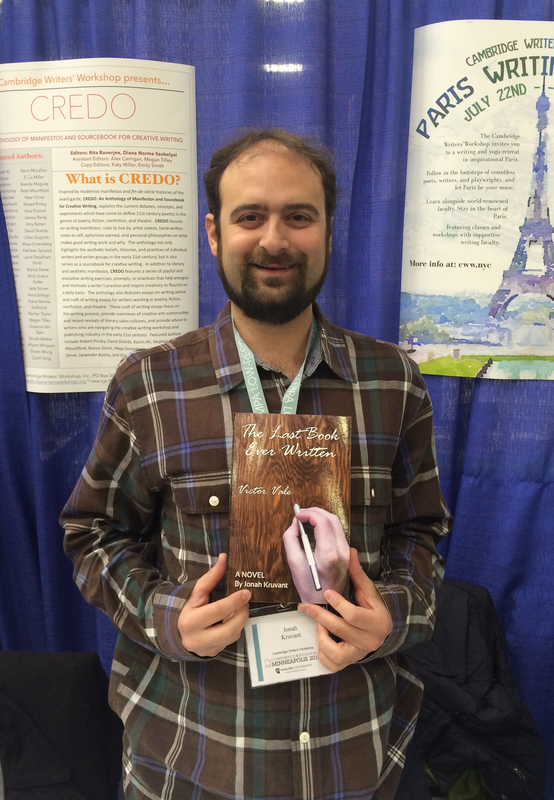 CWW Exec Board member Jonah Kruvant sold his new book, “The Last Book Ever Written,” at our booth. Our staff for the event included CWW intern Alex Carrigan, who helped set the booth up and ran around networking with various publishers and presses. Executive Board member Jonah Kruvant was also at our table on Friday and Saturday. At the table, Kruvant sold and signed his new book, The Last Book Ever Written, a dystopian satire just released from PanAm Books. Dena Rash Guzman and Leah Umansky, friends of the CWW, also were also present at our table for selling and signing their works. Umansky sold her Mad Men inspired chapbook, Don Dreams and I Dream, along with her book Domestic Uncertainties. Guzman was there with her poetry collection called Life Cycle, and both authors promoted the CWW-sponsored reading on Saturday. Leah Umansky and Dena Rash Guzman signed their works at our table on Friday. On Saturday, the CWW headed over to Boneshaker Books for our scheduled reading “Books and Bones at Boneshaker Books.” The event featured twelve readers. Along with Carrigan, Kruvant, Guzman, and Umansky, readers included Anca Szilagyi, Micah Dean Hicks, Michele Nereim, Bianca Stone, Jessica Piazza, Jess Burnquist, Sheila McMullin, and Brenda Peynado. The two hour reading featured a great mix of poetry, short fiction, and book excerpts. 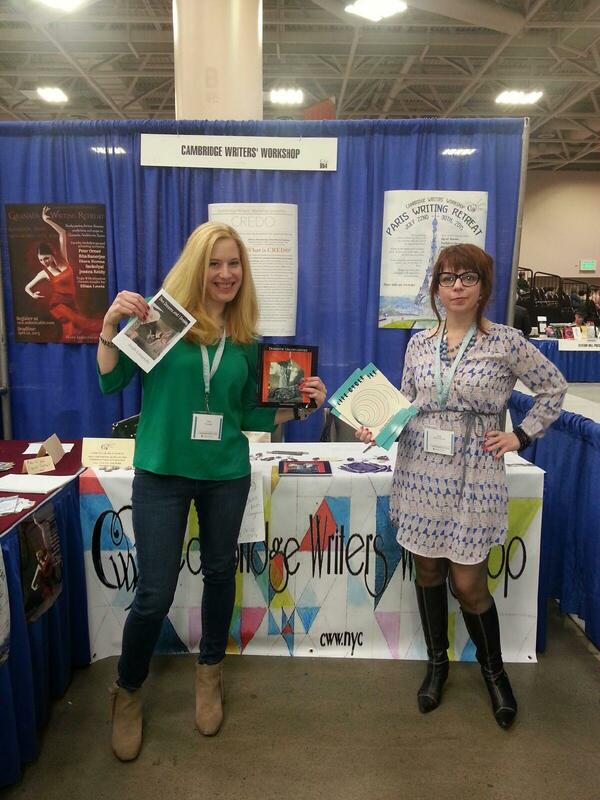 We had a great time at AWP, and we can’t wait to see you next year at AWP 2016 in Los Angeles!